The school year is winding down, and with it comes the last cold of the year. My children have always grown up with herbal remedies. Now that my daughter is over twelve-years-old, she reaches for the adult herbal remedies we keep. Even though our school exposure to human germs is winding down, pollens, wildfire smoke, pollution, etc are just kicking in full gear. We were sent a nasal, sinus, & eye health supplement to try by Rootology. This product uses herbs to target the symptoms of allergies and colds. To combat annoying symptoms like runny nose, congestion, and itchy eyes, most allergy sufferers typically reach for the battery of drugs available over-the-counter. 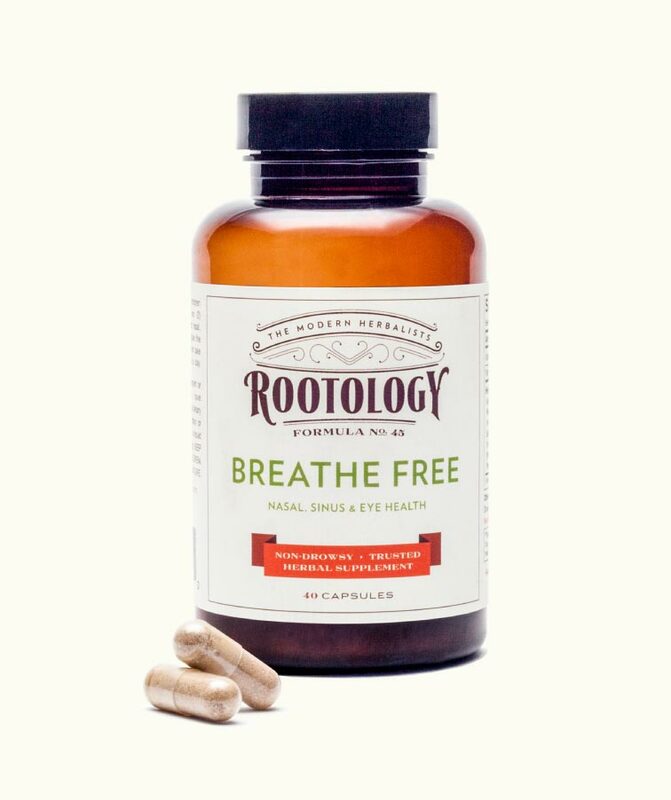 But according to a leading herbalist, a new, all-natural formulation based on Chinese Herbology, called Rootology: Breathe Free, can quiet springtime allergy symptoms in a way most Americans have not experienced. Hagenson says that Xanthium fruit, one of Rootology’s main components, has been used by Eastern herbalists for thousands of years as an effective natural remedy for opening clogged nasal passages. Angelica root is a well-established remedy for relieving headache and sinus pain, and Ledebouriella root is an age-old treatment for itchy eyes. “Rootology contains these three proven allergen fighters, plus 10 additional powerful immune-boosting extracts,” says Hagenson. This is a great product I recommend you keep on hand year round. It is made in the USA. « Do you suffer from hormonal imbalance issues like hypothyroidism & adrenal fatigue?